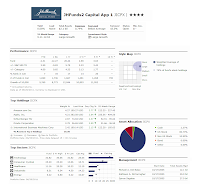 Rated as one of the best US Stock mutual funds, JHFunds 2 Capital Appreciation 1 fund has outperformed its peers. This John Hancock fund can be used as one of the tools for asset diversification. Details about the fund review is below. As the top large growth fund, this JHFunds2 Capital Appreciation fund is seeking long-term growth of capital. The fund invests most of total assets (>65%) in above average growth prospect companies' equity with more than $1 billion in market capitalization. It may minority of total asset (<20%) in foreign equity securities. The fund may invest in U.S. government bond issued or guaranteed by the U.S. government or by its agency. It may invest in mortgage-related securities issued or guaranteed by U.S. governmental entities. This John Hancock II fund may invest in investment grade fixed incomes or bonds. Spiros A. Segalas, Kathleen A. McCarragher and Michel A. Del Balso haves managed this JICPX fund since few days after its inception in October 2005. Investor may invest in this Large Growth domestic stock fund using brokerage account. Please check with your IRA administrator for details. This fund has an annual expense ratio of 0.79%. This expense fee is lower than the average expense fee in the Large Growth category which is 1.31%. There is no 12b1 fee and no front-end sales load fee for this fund. This fund has a dividend yield of 0.08%. This fund has returned 27.41% over the past 1 year and 6.67% over the past three years. Currently the YTD return of this JICPX fund is 8.43%. Currently, this top fund is only available at the limited of 3 brokerages. They are Northwestern Mutual Investor Service LLC, Daily Access Corporation RTC and Trade PMR Transaction Fee. The other class of this best stock fund is the same Other Class (Ticker: JHCPX). This JHCPX fund has 0.13% dividend yield and 0.74% annual expense ratio. 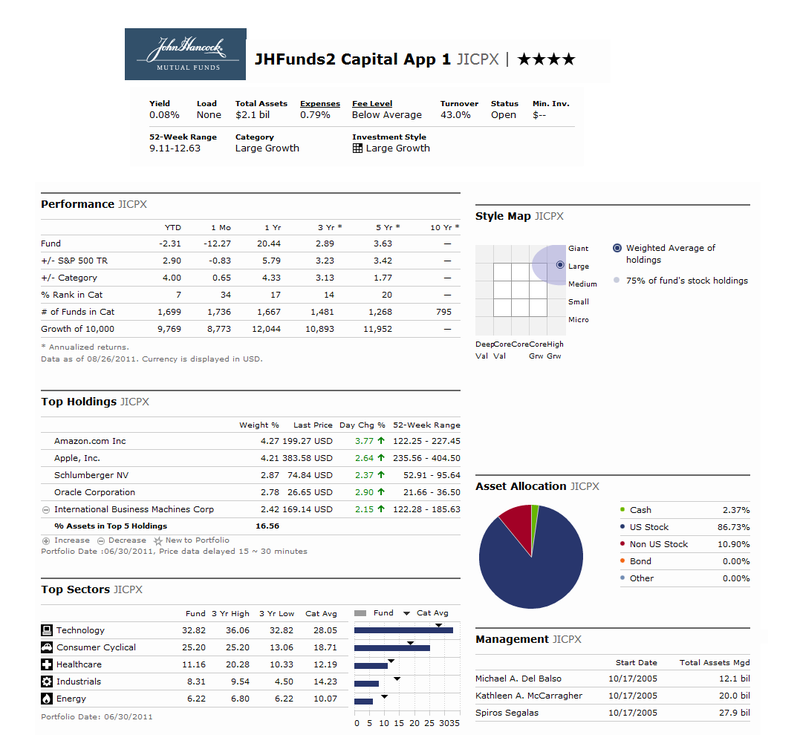 The top holdings of this JICPX fund as of June 2011 are Amazon.com Inc (4.27%), Apple Inc (4.21%), Schlumberger NV (2.87%), Oracle Corporation (2.78%) and International Business Machines Corp (2.42%). These top five holdings represent 16.56% of the total portfolio. The top sectors of this fund are Technology, Consumer Cyclical, Health Care, Industrials and Energy.